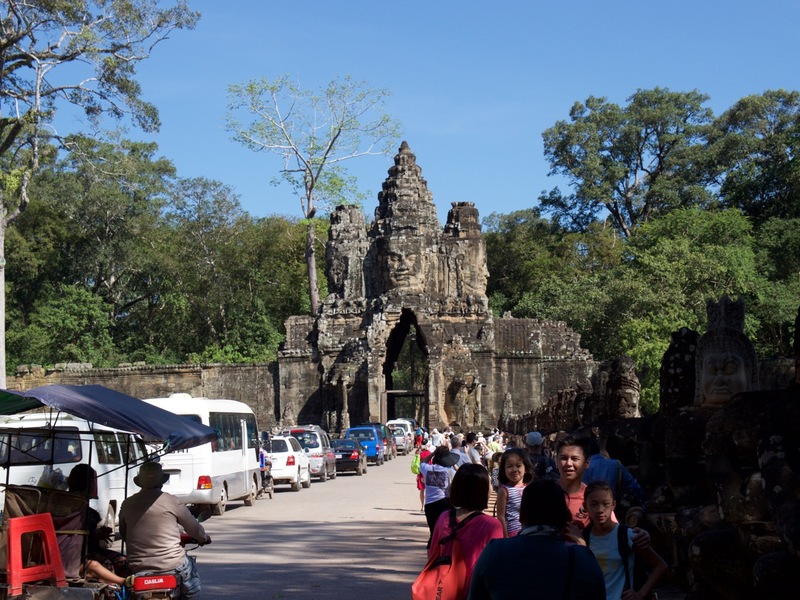 For hundreds of years, the area around the modern city of Siem Reap was the capital of Cambodia. The remains of at least two different capital cities are there. And there are hundreds of temples in the area, associated with one capital city or another. You’ve probably heard of Angkor Wat, which means “city temple”, but that’s only one temple of many. Angkor Wat is the largest religious building on earth, and one of the “wonders” of the world. Seeing these temples was my main reason for wanting to visit Cambodia. The flight from Phnom Penh to Siem Reap takes something like 40 minutes once you actually take off. It’s enough time for the flight attendants to quickly bring by a small bottle of water, and then everyone has to strap back in for landing. There’s not even enough time for them to come pick up the empty water bottles. They just tell you to stuff them in the seat pocket, and let the cleaning crew deal with it later. You can drive or take the bus or even take a boat, if you prefer. It’s a very short distance as the crow flies — the country is small — but the roads are terrible and it takes several hours. Since I was short on time, I elected to fly. I already mentioned the crazy experience I had before takeoff, so let’s get on with the story. I booked a room in a hotel called Popular Residence that got really good reviews online but only cost $25 a night. They’re new and are trying to establish a good reputation, I guess, before raising their prices to be in line with other boutique hotels in the area. After my Phnom Penh experiences (the near-mugging, particularly), I asked for the hotel to come pick me up at the airport. Apparently they didn’t get the message that was part of my reservation, but once I called on arrival, they sent an employee over to pick me up and I rode in great comfort. On arrival, they took care of my bags, gave me a cold hand towel to clean the dirt and sweat of travel off my face, and handed me a delicious lime and mint rickey as a welcome drink. Someone took my bags to the room, and I did the paperwork to check in. 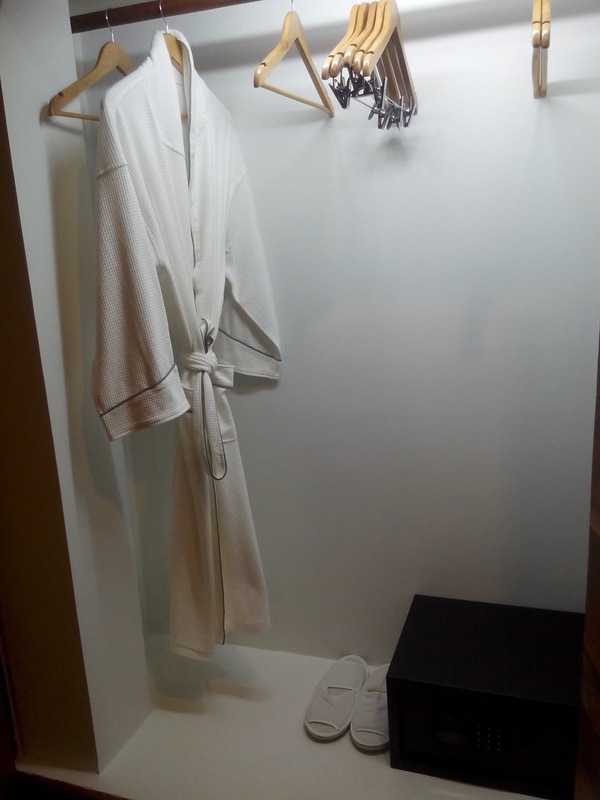 Then someone else told me they had upgraded me to a deluxe suite, and led me to the room. It was palacial — huge, well appointed, and nicely decorated. I had a balcony (which I never even used), a shower, a spa tub (which I also never used), a big desk, a king size bed, TV, and a whole sitting area with couches. Whoa, all for $25! I was tired out from traveling and not sleeping much the night before so I had dinner in the hotel and just chilled out (literally) in my room all evening, and sorted out the remaining travel details for the next couple days. 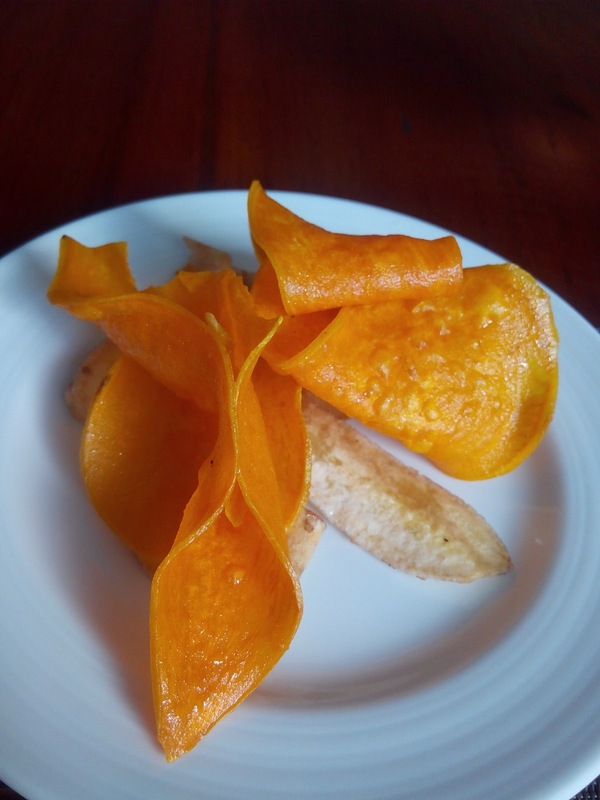 The hotel restaurant served me a little appetizer of a plate of fried banana and sweet potato chips. 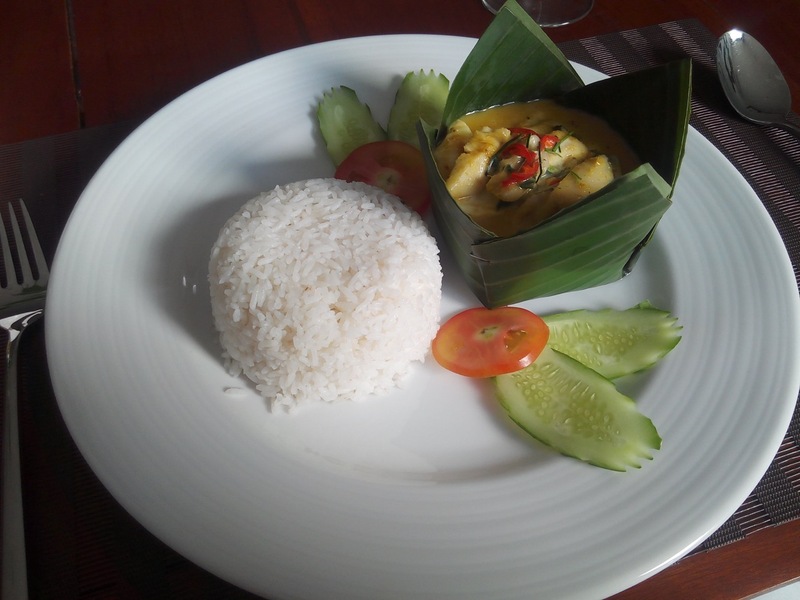 The night I checked in, I had green curry and chicken. It tasted essentially like Thai green curry, but was very, very mild. I assumed they made it that way because they thought Americans would want the food to be bland, but I heard from another tourist later that Cambodian food really is excessively mild compared to Thai food. Either way, the presentation was great, and the taste was good, too. 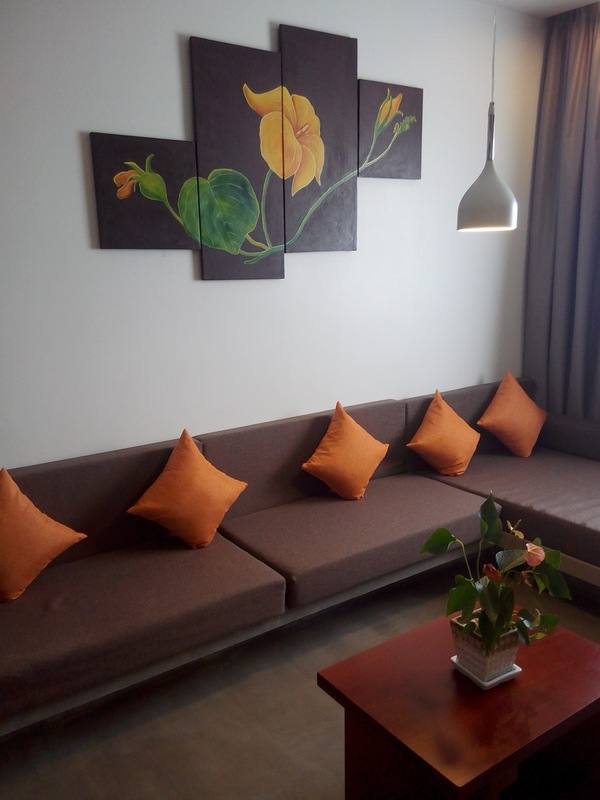 Here is the seating area in my suite, with couches and pillows and real flowers. I’m a little embarrassed to say I never even used it for sitting, but just for sorting laundry and as a place to put my suitcase. 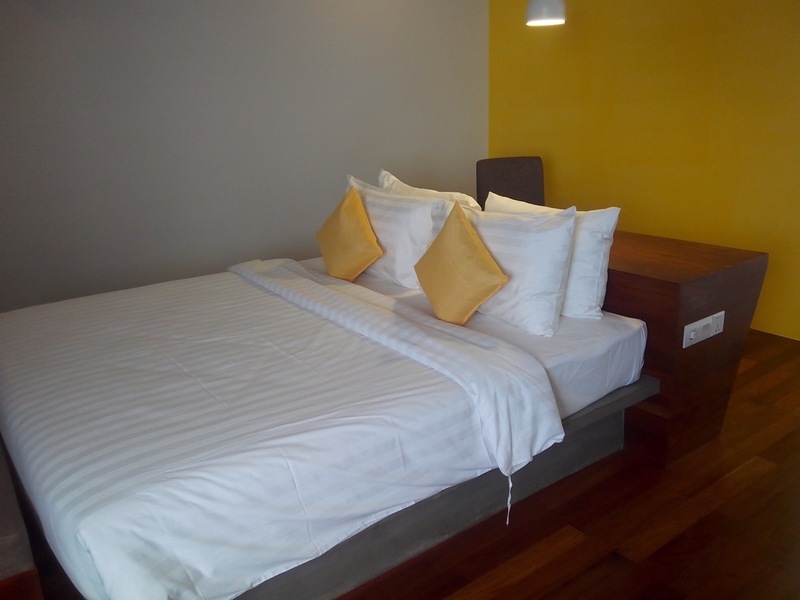 The bed was very comfortable, and there was a big desk and chair behind it. That was a nice change, since most of our accommodations haven’t had a real desk. 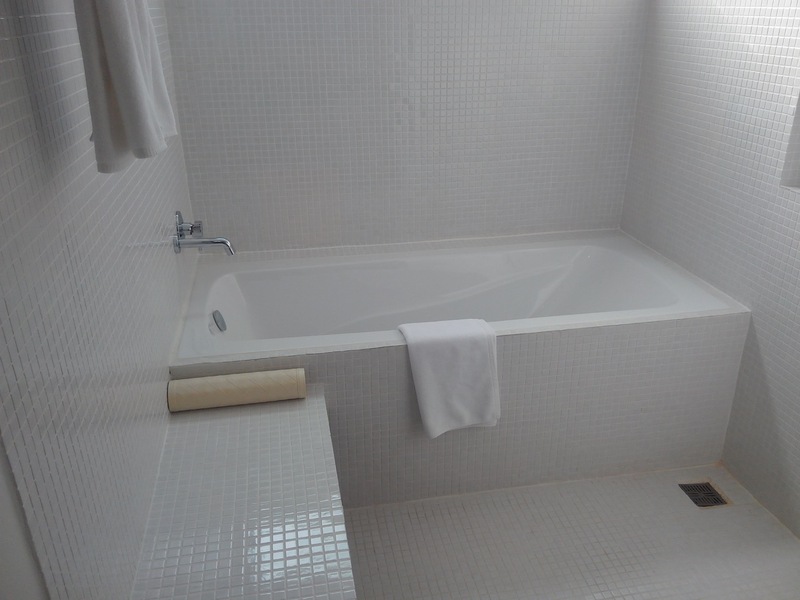 Another thing I don’t think we saw in any other hotel in Southeast Asia was a bathtub. The wet bathroom concept usually just includes a shower. 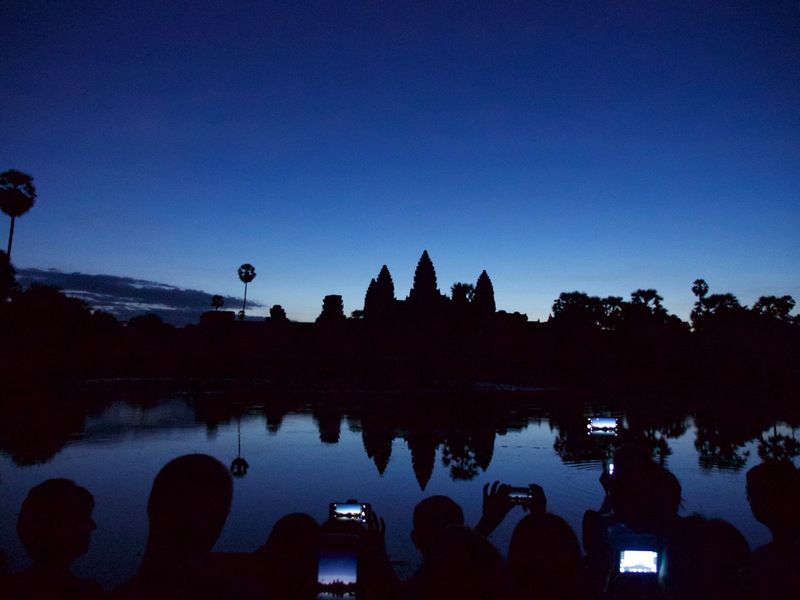 The next morning I would be getting up at 4:00 am because I had booked a guided tour of the temples, with the sunrise Angkor Wat option. And they were going to pick me up at 4:45. I slept like a baby the first part of the night, but then woke up at 2:00 and could never fall back asleep. Too much thinking. At 4:10 I got a call from the receptionist to tell me my tour guide, Mr. Song, was here. I hadn’t even showered yet, so I acknowledged the news, and told her that I will come to the lobby at 4:45. The tour guide didn’t have a driver with him, but once I met him in the lobby at 4:45, he called the driver, who arrived shortly. We drove in the dark to the ticket area. You pay $20 a day for a pass for all of the temples, and there’s one ticket building where everyone lines up to get their passes. It was weird driving toward this place in the wee hours of the morning, passing tuk tuk after tuk tuk filled with two (white, typically) tourists also headed for the ticket counter. It was like a parade. Nobody was on the roads going in the other direction, just a steady stream of tourists following each other to get tickets. Having a car, our driver earned his keep by passing as many of the tuk tuks as possible. 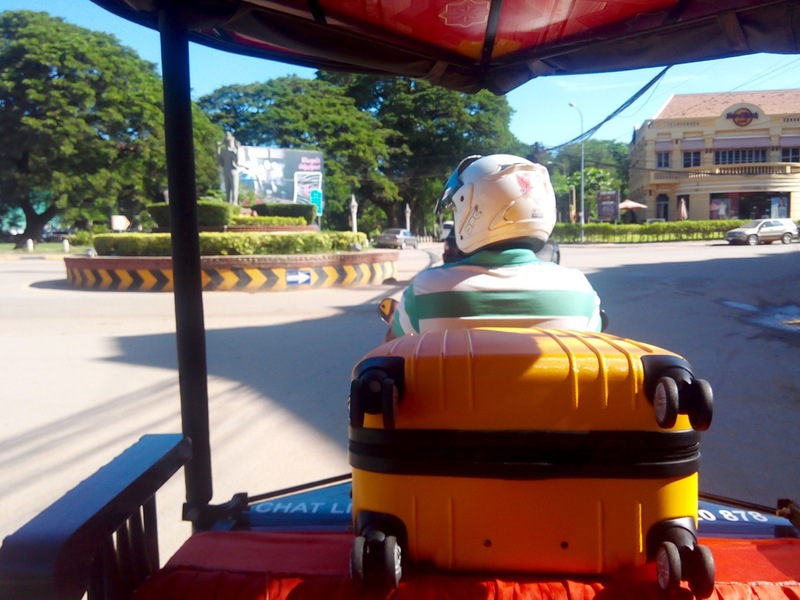 A note about tuk tuks: In Cambodia, they’re officially called remorques, but most people, including the locals, still call them tuk tuks that since everyone knows that word from Thailand. Thai style tuk tuks are a single vehicle that looks like a motorcycle on front with a passenger coach with two wheels on back. It’s all one vehicle. The Cambodian style tuk tuk is a regular (usually old and tired) motorcycle with a trailer hitch that pulls a two wheeled passenger coach. This makes it so the driver can detach the trailer and use the motorcycle standalone when he wants. It also makes the whole thing somewhat more maneuverable, with a shorter turning radius. But it limits the top speed compared to the Thai style tuk tuks. After picking up my parks pass — with my photo printed on it to prevent fraud — we proceeded to Angkor Wat, still in the dark. My guide led me and my backpack to the area west, which is across from some reflecting pools. One of the two pools is about 10x as popular as the other. I took some photos at the popular one, then we moved to the unpopular one where I sat in the wet grass and enjoyed the sunrise with the boxed breakfast my hotel had prepared. They call this the “sunrise tour” but really the view looked better at first light, when the sky was still black and blue, before it started to get orange. I have a feeling most people’s photos look like this one — a photo of a row of people holding smart phones taking photos of Angkor Wat. The whole thing was touristy mayhem. It felt like a rock concert with half the crowd taking photos with their cell phones held high over their heads. I snapped the photos I wanted and then just sat down to let it all soak in, which is how I prefer it. 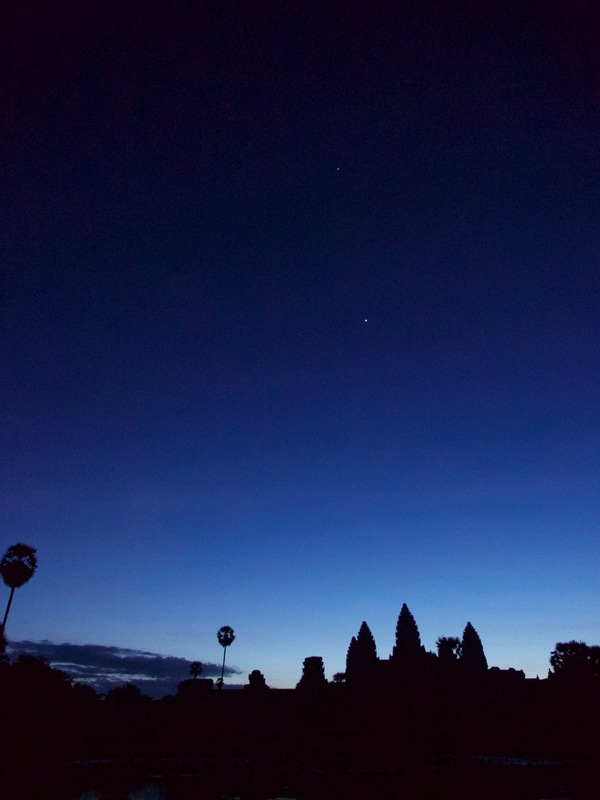 I could see two planets that added to the beauty of first light over the temple and surrounding trees. From an artistic photography standpoint, the popular place to stand to watch the sunrise actually isn’t really that great. I later learned that would be a common theme. During the hikes around the ruins, my guide would point something out to me, tell me this is where everyone takes a picture, and I’d look at it and think, “Yeah, but the lighting is all wrong” or “That’s a crappy angle”. I’d snap a quick photo because it was quicker than explaining why this isn’t an interesting thing to photograph despite the fact that everyone else does it. And then I’d stop and take a photo of something that, to me at least, looked a lot more interesting. That day I learned a lot of history of the Angkor Empire and the temples, which I just loved. There’s no way I could retain it all, but I got the gist of it. Some of the temples of the area were built as Hindu temples, some were built as Buddhist temples, one was built as both, and one was built as Buddhist but later crudely converted to Hindu. 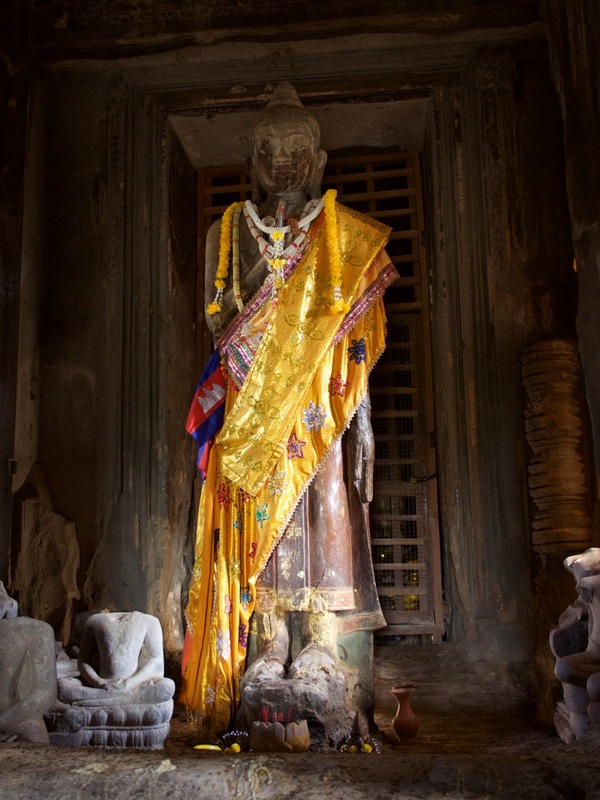 Over the past thousand years, the Khmer (the people of Cambodia) have alternated between Hindu and Buddhist, and are now almost exclusively Buddhist. But their style of Buddhism includes some Hindu elements, and also still includes some animist elements that pre-date both. My guide would occasionally offer to take a photo of me in front of something. 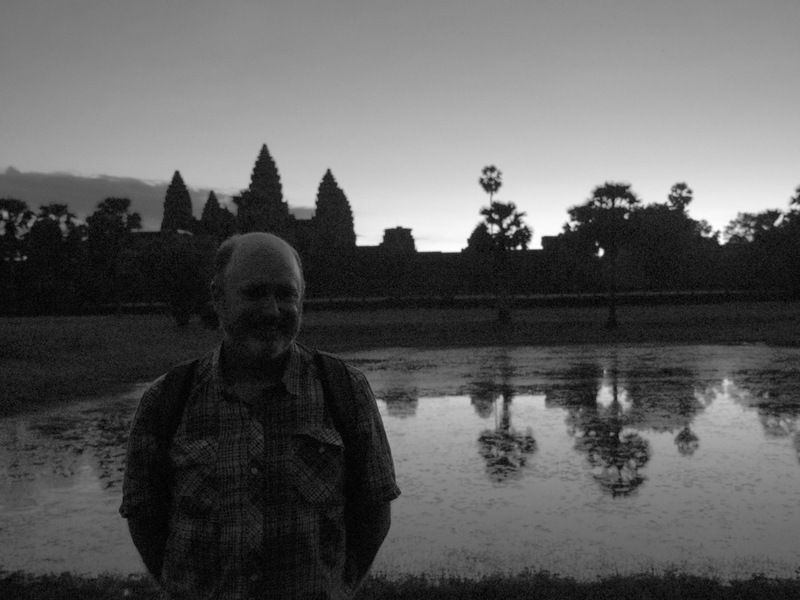 This crappy photo shows me in front of the reflecting pool of Angkor Wat. 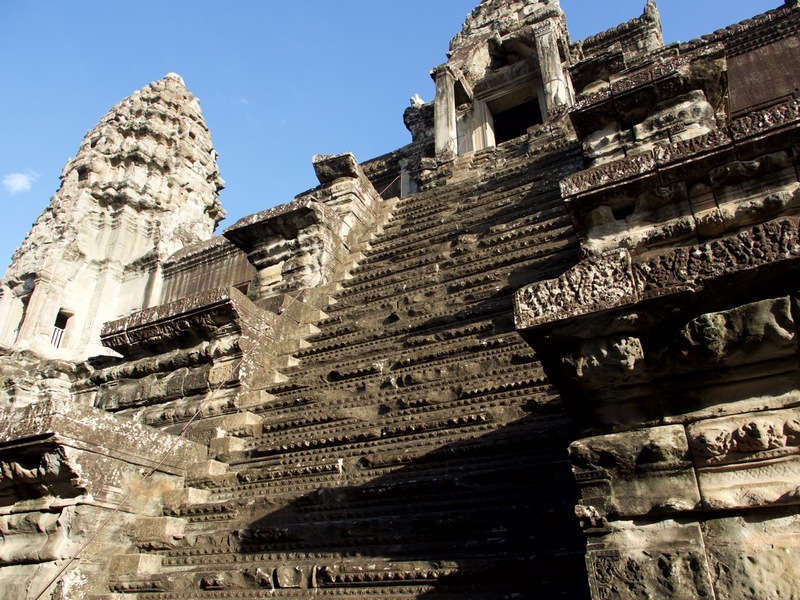 Here are the stairs for the king to ascend to the top level of Angkor Wat. He is the only person that was allowed up there. And he also designed the temple himself, so he made his personal staircase to be not as steep as the stairs that other people got to the lower levels. It’s good to be the king. Windows were filled with these carved stone columns, always in odd numbers. Some windows had five, some seven, some nine. This one had seven, but one had fallen out. The columns let some light and air through, but not birds or people. Over the course of the past 150 years, teams from many different countries have come to Siem Reap to help restore the temples so they can be studied and visited by tourists. An early Indian team made a really bad mistake, which was to use acid on some of the stone to remove moss. The acid caused pieces of the carvings to fall off, as you can see here. 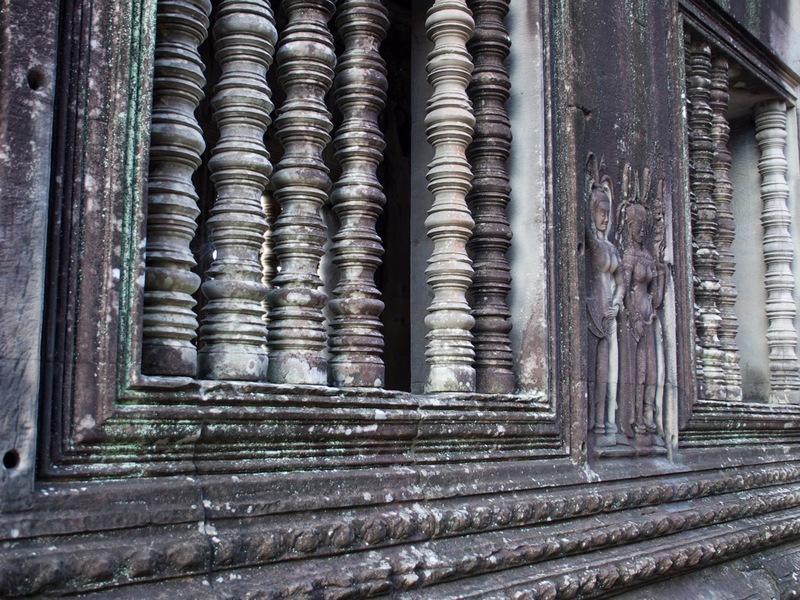 In this close-up, I’m trying to show the intricate detail that the builders of Angkor Wat gave. 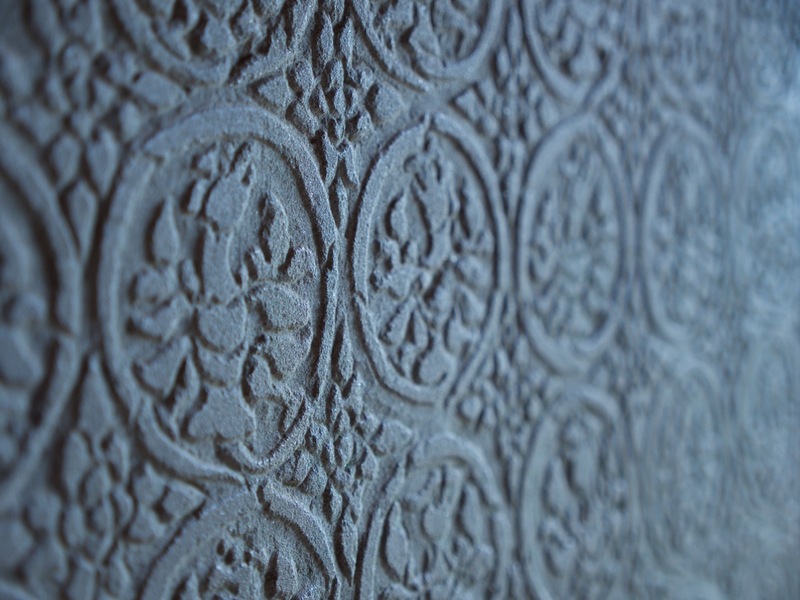 This is just a normal wall, carved with a pattern. 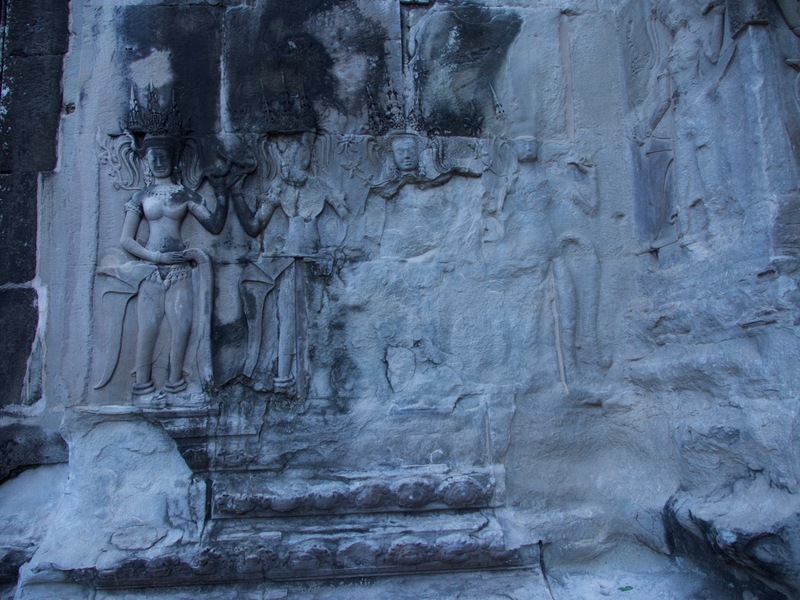 Angkor Wat was built as a Hindu temple to the god Vishnu. 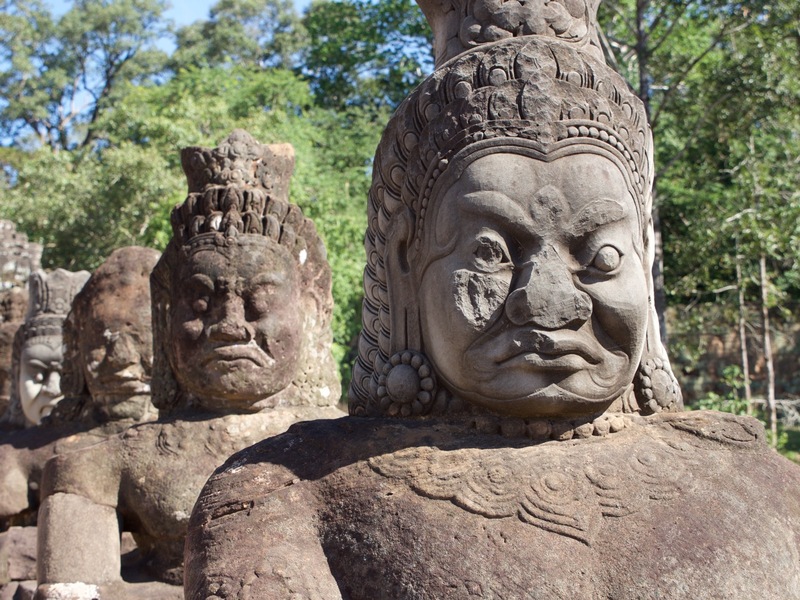 But a few hundred years later, Hinduism had been replaced by Buddhism as the popular religion in the Khmer Empire. So a later king had all the Vishnu statues removed and replaced with Buddha statues, like this one. We took a break for lunch at a restaurant. I went in with my guide. He asked if I wanted to eat in the covered outdoor area with the fans, and I said this seems nice. But then he said the indoor air-conditioned area was nicer. So to respect his wishes, I followed him into that area. I sat down, and that’s when he said he was leaving to go eat next door. Enjoy your meal! Whatever. I guess he was looking out for me in some way. The food was OK, but hugely overpriced. I would’ve been fine just eating street food. But maybe the tour company has a deal with this restaurant or something. Anyhow, after lunch I felt rejuvenated and we visited a couple more temples. By 2:00pm I was starting to flag, though. My brain was full of history and architecture, I was hot and sweaty, and we’d been walking around these temples for six or seven hours now. 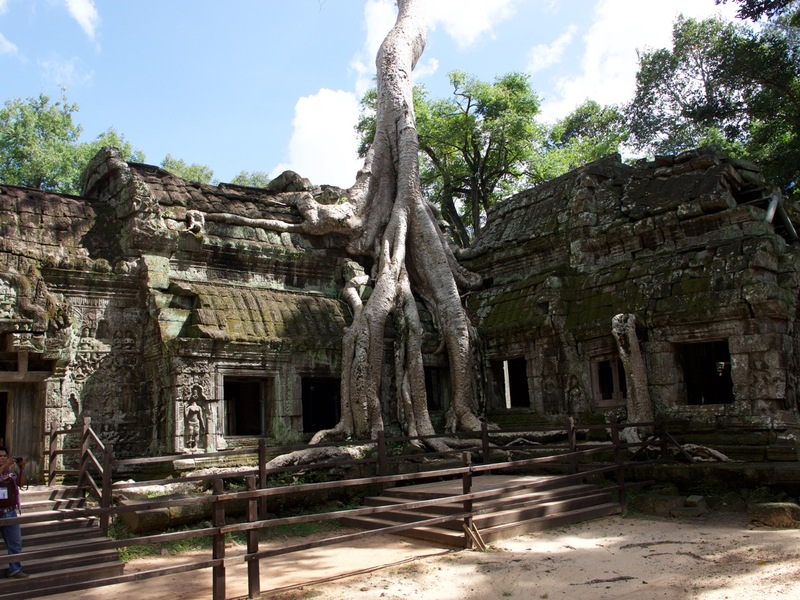 Here is one of many trees that remain at Ta Prohm, also known as “Tomb Raider Temple”. The restoration plan for this temple was to leave as many of the trees as possible, to show it in its natural state with the jungle taking over, as opposed to the reconstructed look of Angkor Wat and many other temples. I asked the guide to take me by a place where I might buy a Khmer-style scarf. The driver stopped at a silk store that had disgorged two huge busfuls of Chinese tourists into the shop. I looked around but didn’t see anything that I liked enough to pay the price, even the discounted price. So they took me back to the hotel. I paid them, tipped the guide generously, and said goodbye. The cool towel and glass of cold water the hotel staff gave me was the perfect way to end the day of Siem Reap temples. If you want to see more of my best photos of the one day Siem Reap temples tour, check out my Flickr album. There are 76 pictures there total. The next morning, I traveled to the airport by way of tuk tuk, with my giant yellow suitcase just sort of balanced on top of the front seat of the trailer section. It never fell off, but I kept worrying that it would, every time the driver hit a pothole.